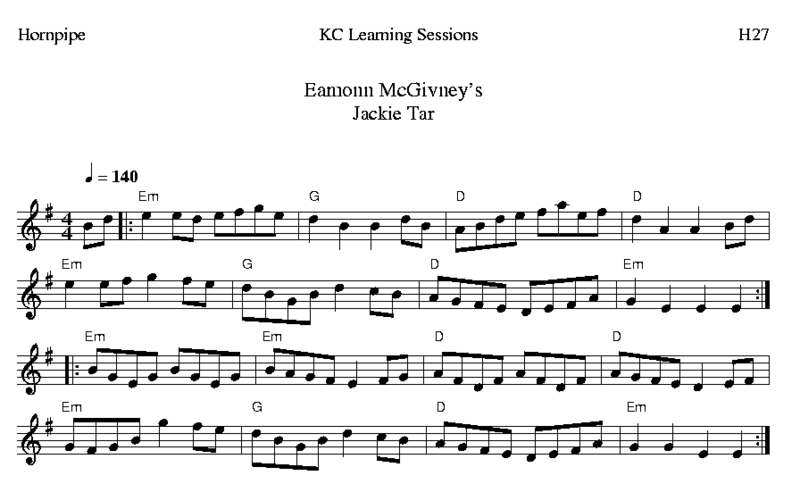 I learned this hornpipe as “Éamonn McGivney’s,” though there are not many around here who call it that. Éamonn McGivney’s is a fiddler from Miltown Malbay, Clare co., and this is (apparently) his setting of a version of “Cuckcoo’s Nest” which is also a version of “Jacky Tar.” This hornpipe is probably most widely known as “Jacky Tar” or “Jackie Tarr,” and much less often called “The Cuckcoo’s Nest.” However, both of these names are also applied to other tunes, and very different versions of these tunes as discussed below. Those who call it “Jackie Tar” likely picked the tune up from the Nic Jones LP The Noah’s Ark Trap (1977), track 2. It’s an extremely popular English melody known throughout British North America and the IONA — IONA is an acronym for “Islands of North Atlantic” and was proposed by Sir John Biggs-Davison in 1980 to refer collectively to England, Wales, Scotland, Ireland, the Isle of Man, the Shetland Isles, and the Channel Islands. It’s intended to provide a less politically volatile alternative to “British Isles,” a phrase of which many people in Ireland are not especially fond. Whack-fol-the-diddle! Unfortunately, the down-side of the acronym is that “IONA” actually excludes the majority of North Atlantic islands. The term “Jacky Tar” or “Jack Tar” used to refer to sea-men from England (in the 18th and 19th centuries) and in the States (after WWI). The tune is played as a reel or hornpipe, and is also almost the melody for a song entitled the “The Cuckoo’s Nest” – a title which refers to female pudenda. It dates to at least the early 18th century. James Aird’s printing of Aird’s Airs, vol. 1 (1782) includes an interesting fourth strain, not found in other sources. Matt Seattle in his The Great Northern Tune Book: the William Vickers Manuscript of 1770 (1987, 1994) offers part of the familiar Scots argument that every tune that has ever been played was originally Scottish. Seattle writes that this tune was originally used for a Scottish Highland Dance (a.k.a., Scots Measure) in D Minor with the title “Come Ashore Jolly Tar (with) Your Trousers On.” He does admit that many versions of this tune exist, with quite substantial variation between them, in various keys and modes – in fact, he remarks that the Northumbrian William Vicker’s late 18th century setting is evidently minor, despite the key signature. This tune-title appears in numerous 18th and 19th century dance collections, and the tune made Henry Robson’s list of popular Northumbrian song and dance tunes, which he published c. 1800. In his Jacobite Relics (1819) James Hogg prints a song to the melody, commenting: “It must have been a great favourite in the last age, for about the time when I first began to know one tune from another, all the old people that could sing at all, could sing “The cuckoo is a bonny bird” — which is the first line of a rather ribald version song. So apparently, those that could sing at all liked bawdy songs. This article was posted in ABC format, Dots, Hornpipe, Irish Tunes, Irish-American Culture, MP3, Slow Session, Tune, Tune Comment, Very Popular and tagged ABC format, History, Hornpipe, Irish Session, Learning Irish Music, Recordings of Irish Music, Session Tunes, Teaching Irish Music, Tune History. Bookmark the permalink. Follow comments with the RSS feed for this post.Post a Comment or leave a trackback: Trackback URL.